Football teams at all levels are either underway with their football seasons, or about to embark on them. It’s time for them to get ready for their football seasons, and it’s also time for broadcasters to prepare for their play-by-play assignments. While you won’t have to physically work as hard as the football players do in training camp, there is some pre-season work that can be done to sharpen the minds of play-by-play broadcasters. I have begun my play-by-play training camp by doing some housekeeping, assembling my tools, and getting some practice reps before the season begins. If you’re like me, there are some scoresheets and spotting boards from the past season that can be filed away or discarded. Also, I am committed to using a three-level filing tray where I can put important papers from my primary job, my Wash-U information, and family information in separate trays. Sometimes I tend to put everything in one big stack on a desk, and I have found that documents with various degrees of importance tend to get lost in such a stack. What is especially important for me now is to assemble my blank stat sheets, spotting boards, drive charts, and head-to-head comparison sheets. Do any of them need revamping? I have changed my football spotting boards a bit to include larger player spaces for more information; and I created a soccer spotting board with large player areas for the same reason. My “Tale of the Tape Head-to-Head Stats Comparison” sheet has also been revised to include more information for my broadcasts. Review those documents, change them if necessary, and make enough copies so you won’t have to scramble at the last minute to do so. If you don’t have some of these documents, you can download versions of them from the STAA website by clicking on the “Spot Charts and Stat Sheets” link from the Resources page. I have also used football stat sheets from the Illinois High School Association website for many years. They are easy to use, and will help you tell a more informed story if you don’t have access to updated computer stats of a particular game. After I assembled those documents, I am now gathering writing materials: pens, markers, highlighters, legal pads, copy paper, and printer ink. Most, if not all of the play-by-play fraternity members color-code information as a way to organize it and put it in compartments on spotting boards; to differentiate what players did in each quarter or half of a game; and to fill out stat sheets and spotting boards with team colors to aid in memorizing players’ names and numbers. Much like kids and their parents who are shopping for back-to-school items, I am going to stores to purchase back-to-broadcasting items. The last item of housekeeping involves my vision. Along with locating my binoculars, I am going to schedule an eye exam for later this month. Several years ago, I noticed that the player numbers on football uniforms were a little fuzzy around the edges. Not a good thing for a play-by-play person. A subsequent eye exam revealed that astigmatism had eroded what used to be slightly better than 20/20 vision. A pair of eyeglasses fixed that problem very nicely. If you can do so without great expense, it would be a good idea to have an eye exam especially if your eyesight seems to be changing; and a physical checkup might be a good idea too if you can swing it. Just as football players get their equipment, playbooks, and physical exams to begin their training camp, broadcasters should get their tools of the trade assembled and physical exams completed before the season gets under way. Summer baseball broadcasters have a nice advantage over those who have been on the proverbial beach because their eye-to-mouth coordination is sharp entering the football season. For those who didn’t have that fun luxury, fear not. 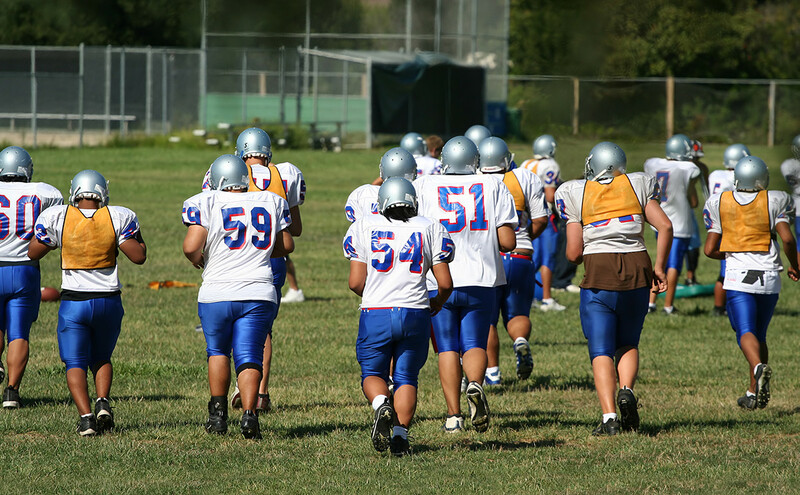 There are still ample opportunities to sharpen the skills to a razor’s edge for the upcoming football season. Back in the day, circa 1990 at the start of my career, there were very limited opportunities to get practice PBP reps before the season-opening kickoff. There were a few NFL pre-season games on TV that one could watch and do a sample play-by-play call of them with the sound turned down. There was a scrimmage or two that you could watch in person from a press box or the bleachers, and do some PBP in your head. But if you missed those opportunities, there was a bit of anxiety leading up to the first football broadcast. A fear that the call of the first couple of series would be out of sync, or rough around the edges, until you became squarely and comfortably back in the saddle. Things have certainly changed in 25 years, for the better. Now, if you have cable TV, there is nearly an unlimited amount of football games to watch…even before the season begins! It is like going from getting a handful of golf balls to hit at a driving range, to getting the mondo jumbo basket of 500 golf balls that takes several hours to empty. Along with the practice PBP reps, it’s a good idea to listen to parts of one of your broadcasts from last season. A review of a broadcast may reveal a spot or two in which you can positively tweak your style before the new season begins. If you engage in some degree of a play-by-play football training camp you will enjoy a nice payoff when that opening kickoff is sailing high and deep to start the football season!